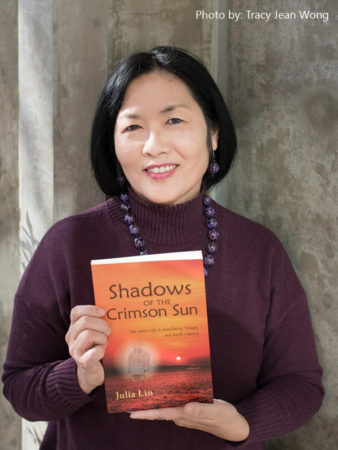 We recently came across Taiwanese Canadian author Julia Lin’s recently published book, Shadows of the Crimson Sun: One Man’s Life in Manchuria, Taiwan, and North America. This biography of Dr. Charles Yang, a community leader and activist living in Vancouver, Canada, caught our attention because of the unique formative experiences that shaped his perspectives and life of activism. At the same time, his story echoed many of the experiences of the first generation Taiwanese who immigrated throughout North America throughout the 1960s and 70s; these physicians, scientists, and graduate students would be among those instrumental in the overseas movement supporting democratic change for Taiwan. We take a moment to interview author Julia Lin about the book and her motivation for writing it. We also explore a little bit about her own life as an emerging author. Ho Chie: Hi Julia. Thanks for joining me. I’m excited to chat with you about your new book, Shadows of the Crimson Sun. Julia: It’s a pleasure. Thank you for taking an interest in the book. In the past few years, we’ve been fortunate to see several fiction and non-fiction writings that focus on the Taiwanese and/or immigrant experience, especially those encapsulating the untold stories of the White Terror era. Yours is unique in that it focuses on one man’s biographical story. What inspired you to choose this approach? In 2013, after the publication of my first book, a short story collection featuring Taiwanese immigrants in Canada, Mr. Ruey Satake (林瑞麟), president of the B.C. Taiwanese Canadian Historical Society, invited me to a meeting with the association where he asked if I would write a biography-based account of modern Taiwanese history and emigration. I agreed to write a book, thinking that I would be gleaning stories from the numerous videotapes that the society had already made of Taiwanese immigrants in British Columbia. Mr. Satake passed away soon after that meeting but I felt I still needed to honor my word. As I thought more about the project, I realized that an account of one man’s life would allow for a more engaging and deeper understanding of the Taiwanese immigrant experience. 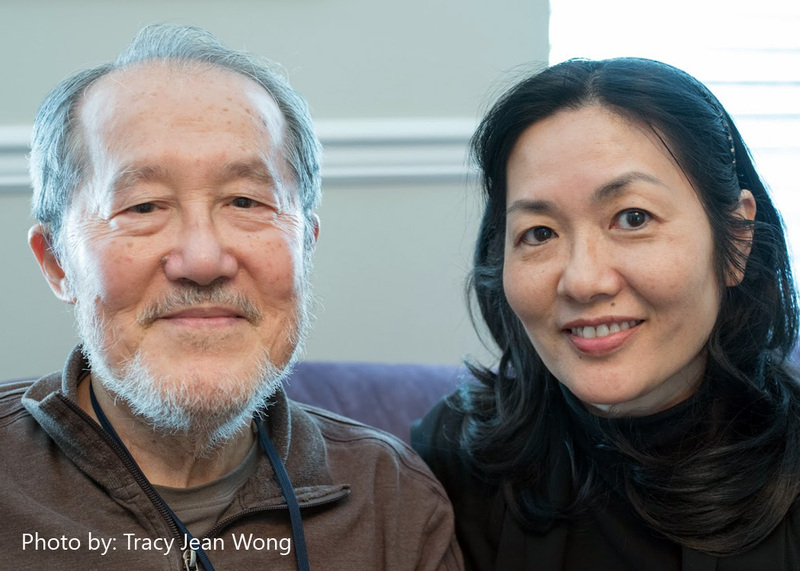 So, how did you come across Dr. Charles Yang’s story? Looking through the society’s archives, I came across some quotes attributed to Dr. Yang, a well-known elder in the Vancouver Taiwanese community. I was struck by Dr. Yang’s frankness and by his unusual Manchurian childhood. I began interviewing Dr. Yang at the beginning of 2014 and completed the book in 2017. The most challenging thing about writing the book was trying to verify facts, especially of accounts from Dr. Yang’s childhood in 1930s and 40s Manchuria. I made two trips to Taiwan for interviews and research in local libraries and universities, and while documents about the White Terror were plentiful, Manchurian histories were not. The history of the Taiwanese in Manchuria during Japanese rule is a very specialized area of academic research. I was also hampered by my lack of fluency in written Chinese and Japanese. Fortunately, my father and Dr. Yang himself helped me immensely in this regard. And, what was the most rewarding? This challenge also yielded the greatest reward. Prior to doing the research, I, like most people, had little knowledge of the experiences of the Taiwanese in Manchuria. Many people, even older Taiwanese, have remarked how they never knew there was a significant population of Taiwanese in Manchuria in the first half of the twentieth century. 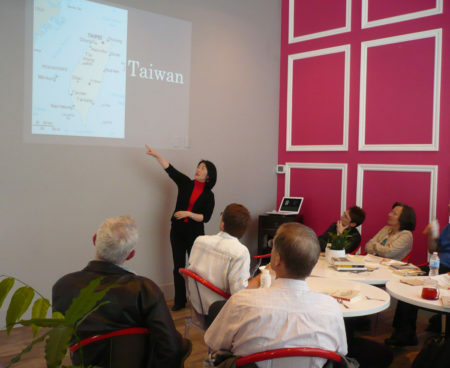 I enjoy sharing my findings with others, be they Taiwanese, Taiwanese-Canadian/American, or non-Taiwanese. Yes. That is quite fascinating. I actually had no idea, either. And I completely appreciate that you’ve used this as an opportunity to reach out to a broader audience. So, tell me a little more about yourself and how you got into writing to begin with? I was born in Taiwan and immigrated to Canada when I was nine. Trained as a scientist and later math and science teacher, I had no intention of embarking upon a writing career and wrote only for pleasure. After taking a writing course with well-known writer, MG Vassanji, I was persuaded to publish the collection of short stories that I had written in the program. My reluctance to publish stemmed from my desire to protect my family’s privacy. I needn’t have worried because it’s difficult to become a famous writer. I continue to teach full-time but am slowly making a name for myself as an author. Being a Gen 1.5 Taiwanese-Canadian has given me a unique vantage point from which to see the world and enriched my writing immensely. Living in multicultural Vancouver (the most Asian city outside of Asia) has also given me opportunities to engage with a diverse range of immigrants and non-immigrants, all very useful for being a writer. I find it fascinating that our immigrant experiences and cross-cultural encounters often drive some of our interests and passions in life. In your previous book of short stories, Miah, your protagonists are typically Taiwanese Canadians who discover more about their family’s history or confront cultural conflicts through their personal journeys. For you, was there a natural progression from writing these fictional vignettes to tackling a more profound analysis of Dr. Yang’s experience? While writing Miah, I found myself alluding to Taiwanese historical events and cultural practices but unable to fully explicate them because I was confined by the demands of the short story form. I’ve always been fascinated by the forces that drive historical events and the impact of political change on the lives of ordinary people. In writing a non-fiction book, I was able to indulge my love of history in a way that I am unable to fully do when I’m writing fiction. Dr. Yang’s biography has allowed me to set the life of an ordinary Taiwanese in the historical framework of his times. The Taiwanese who lived through Japanese colonialism and Chinese dictatorship then emigrated overseas saw incredible changes in the space of their lifetimes. The turbulence of geopolitical conflicts directly impacted their lives in a way that those of us who have only ever known peace and stability can never fully understand. A non-fiction book allowed me to delineate the historical background better than a fictional work and I learned a great deal in the process. I’ve been thinking recently about how the 1st generation of our Taiwanese diaspora to North America are aging and how so many of these early freedom fighters have passed. I wish we could capture more of their stories, accomplishments, hopes and dreams. I think there is a certain urgency to do this before this generation who experienced Taiwan in this turbulent period of colonial to democratic transition completely disappear. I wonder what your thoughts are about this critical period. I completely agree with you, Ho Chie. That Taiwan could transform itself into a democratic society from unpromising beginnings in such a short time is a remarkable feat and we should record and honor the lives of those who contributed to the transformation. Preserving these stories is important but the task requires passion, energy, time, and resources that may not always exist. However, each family has its own story and I urge people to set down whatever they can now, for the sake of their own descendants if nothing else. Even oral histories saved in the form of home videos might prove to be useful for future historians. For those of us in North America, I would also add that in order for such records to be accessible to younger Taiwanese who did not grow up speaking Taiwanese or Mandarin we should try to provide English translations when possible. Great advice, and I completely agree! Hopefully our “library” of resources increases over time. What do you hope the readers of Shadows of the Crimson Sun walk away with? I hope people will have a better understanding of Taiwan’s unique position in the world. One of Dr. Yang’s passions is the political future of Taiwan. Even though he is a Taiwanese independence advocate, I tried to write the book in as balanced a way as possible while accurately representing his views. I also hope I conveyed the resilience and flexibility of the Taiwanese as they continually adapt to changing circumstances. Those who have immigrated to North America like Dr. Yang have integrated themselves into new countries and many consider their adopted lands home and are deeply involved in North American life. As Dr. Yang says in the book, it is only by contributing to our new countries that the rest of society will respect us. I also hope that non-Taiwanese readers will have a greater understanding of the values and background of the Taiwanese which may then help inform their views, political or otherwise. Thank you so much for your work and for your time today. Thank you for having me. I welcome feedback from your audience about my writing and my comments.